In Benjamin Percy's new thriller, a post-apocalyptic reimagining of the Lewis and Clark saga, a super flu and nuclear fallout have made a husk of the world we know. A few humans carry on, living in outposts such as the Sanctuary-the remains of St. Louis-a shielded community that owes its survival to its militant defense and fear-mongering leaders. Then a rider comes from the wasteland beyond its walls. She reports on the outside world: west of the Cascades, rain falls, crops grow, civilization thrives. But there is danger too: the rising power of an army that pillages and enslaves every community they happen upon. Against the wishes of the Sanctuary, a small group sets out in secrecy. Led by Lewis Meriwether and Mina Clark, they hope to expand their infant nation, and to reunite the States. But the Sanctuary will not allow them to escape without a fight. http://Lizzy11268.booklikes.com Liz Loves Books.Com. 4.0 The Dead Lands - Benjamin Percy Review. 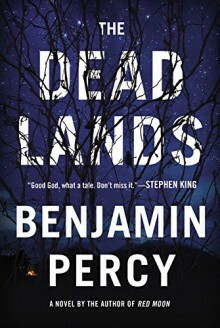 text The Dead Lands - Benjamin Percy Review.